HALLOWEEN CLUB’S 6TH ANNUAL SPOOK SHOW FESTIVAL - Halloween Discussion Forums, Costumes, Horror! 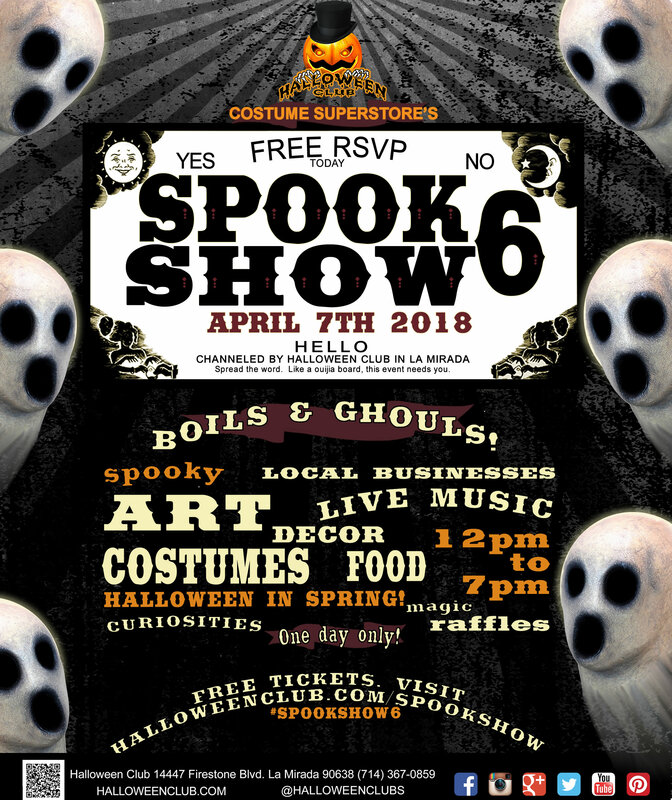 La Mirada – April 7th, 2018 – Spook Show is an annual Halloween festival that features over 100 curated local vendors, artists, collectors, teachers, spook makers, hauntrepreneurs and musicians for like-minded Halloween enthusiasts. Halloween Club will also hold their biggest yearly sale event on 1000s of costumes, accessories and decorations. Tickets are free, but a reservation is required. The event is all ages, but some acts/items may not be suitable for kids. Parental discretion is advised. Halloween Club will also hold their biggest yearly sale event on 1000s of costumes, accessories and decor.